Private health firms are to be paid £1bn to carry out hundreds of thousands of diagnostic tests on NHS patients. The money, allocated over five years, will fund checks such as blood tests, MRI scans, ultrasounds and endoscopies. Ministers hope the plan will help them meet their 2008 target of maximum 18-week waits between seeing a GP and NHS hospital treatment in England. The Conservatives accused Prime Minister Tony Blair of hypocrisy for using the private sector. Private sector providers will be invited to bid for the diagnostic test contracts over the coming weeks. The 18 week waiting target is a vital priority for Labour, says BBC health correspondent Adam Brimelow. "It covers all appointments and tests from the time the patient's referred by their GP, to when they have their operation," said our correspondent. "That includes any delays for diagnostic tests such as scans, which aren't recorded in official figures at the moment, but which can take more than a year." 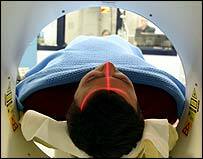 Health Secretary John Reid said the total number of scans would go up 40% by 2007/8 to 8.9 million a year. One million of them would be in the private sector. Mr Reid said: "We know that many patients are caught in a bottleneck of waiting for a scan or other diagnostic service before they are referred for an operation. "This can be a worrying and uncertain time; to them it is very much part of the time they have to wait." He defended the use of the private sector, pointing out that other contracted-out services had proved popular with patients. "Expanding capacity in this way allows the local NHS to quickly tap into good value, high-quality clinical resources and ensure patients are treated in state-of-the-art facilities." Dr Jacky Davies. a member of the British Medical Association's Consultants' Committee said: "It is obviously good news if patients do not have to wait so long for either their diagnostic tests or their operations. "However, the BMA questions why this money cannot be directed to the NHS. We have heard of MRI scanners in NHS hospitals sitting unused while patients are scanned elsewhere. "Hospitals will not be able to survive if their workload is taken away. "So far the outsourcing of imaging services has not been value for money and patient care has suffered." Shadow Health Secretary Andrew Lansley said: "It is typical hypocrisy by Mr Blair's government that they criticise Conservatives for using the private sector in health and then seek to do the same themselves. "The trouble is that Labour are not creating a right to supply for the private sector which would maximise new investment and capacity." Last summer, the government completed a deal with Alliance Medical to provide 120,000 scans in mobile MRI scanners. Mr Reid said that had resulted in a "dramatic" drop in waiting times. Liberal Democrat health spokesman Paul Burstow said: "There are serious doubts about the value for money ministers will achieve with these contracts. "Offering a contract in such an important area without consulting with the frontline staff concerned is a recipe for bungled implementation and wasted taxpayers' money."